Economic Despair: Money causes inflation - is that so hard to understand? Money causes inflation - is that so hard to understand? Why are the easiest lessons the hardest to accept. Take the relationship between money and inflation. Since the Romans, people have understood that if a government produces more money, prices rise. It is as simple as that. Does the Fed accept this most basic of economic relationships? 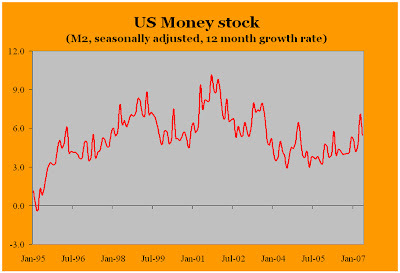 The chart above tracks the 12 month rate rate of the most important measure of the money stock - M2. In 1995, the Fed did understand the importance of controlling the money supply. They had managed to get monetary growth down to around 1 percent a year. Then something happened. Collectively, the FOMC must have taken a stupid pill. The committee ordered the guys in the basement to crank up the printing presses. In 1996, the money supply started to rise very rapidly indeed. What were the consequences of all that extra money? The US got two speculative bubbles in a row. First,there was the stock market bubble, which reached a frenzy with the dot.com fiasco. The Fed calmed things down a little in 2000, raised rates and the dot.coms bombed. Undeterred, the Fed went at it a second time. In 2001, just after 9-11, the money supply began to increase, interest rates came down, and off went the housing bubble. Today, that mess is still being cleared up. So, two speculative bubbles in ten years; with the dollar sinking to record lows. Few central banks have such a dismal record of incompetance. The federal government did their part. Encouraged by lower interest rates, it ran up a large fiscal deficit to complement the monetary chaos over at the Fed. So, in macroeconomic terms, where is the US right now? It has a massive current account deficit; a large fiscal deficit; rising government indebtedness; personal debt is at an all time high; the economy is slowing, while the housing market has fallen down a dark hole; and to top it all, the Fed still has the money supply growing at around 6-7 percent annually. What is the way out of this mess? Again, it is nothing complicated. The Fed must reduce the growth of the money supply, which means higher interest rates. This will encourage private sector savings, and reduce personal sector indebtedness. Higher interest rates will also discourage the federal government from running up large deficits. This recipe may involve some upfront costs - a recession is very likely. However, continuing this macroeconomic mess will only delay a much deeper and more painful economic downturn later. Sadly, the Fed has still not quite understood the relationship. As the chart above indicates, monetary growth is still way too fast. Although, the housing market is unwinding; the Fed have ensured that there is still plenty of inflationary pressure building up. Sooner or later, rates will have to go up again. No, it is not hard to understand. It is also not hard to understand that people prefer the risk of great future pain vs. the certainty of moderate immediate pain. The FOMC will continue to muddle through. Until it can't. "If the American people ever allow private banks to control the issue of their money, first by inflation and then by deflation, the banks and corporations that will grow up around them (around the banks), will deprive the people of their property until their children will wake up homeless on the continent their fathers conquered. "